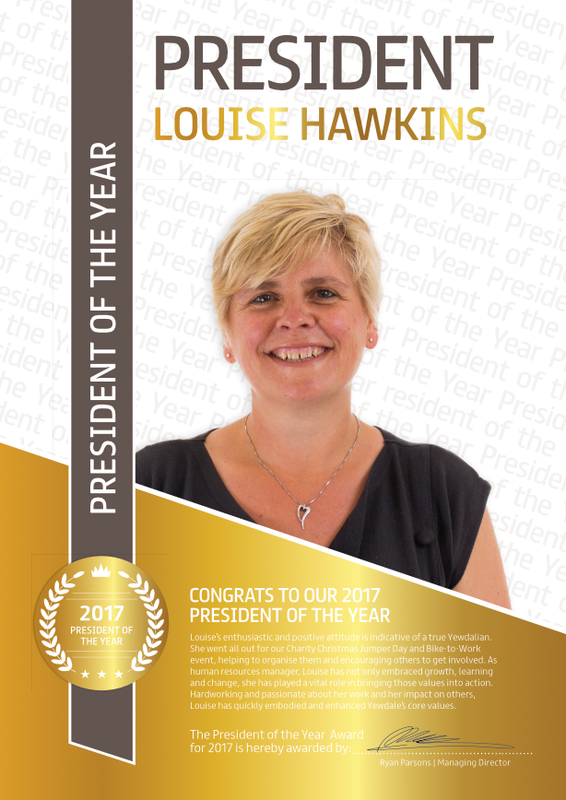 Congratulations to Louise for winning our President of the Year award for 2017. Louise was voted the person who embodies Yewdale’s core values the most, and received the award at our Annual General Meeting at Chelmsford City Racecourse in January. Yewdale’s seven core values are a key part of our culture as a company, guiding how we work, how the company does business and how we interact with each other. Louise has only been with Yewdale for a relatively short time, but has certainly proved to us that she is a true Yewdalian. Always enthusiastic to take part in our charity events and very happy to help wherever she can, Louise is a deserving recipient of the award. You can find out more about Louise by visiting her profile page. Matt (left), Darren (centre) and Richard (right) were also Highly Commended.